As a measure of West Ham United�s startling transformation into contenders for Champions League qualification, perhaps nothing illustrates it better than a draw here feeling more like a defeat than a decent result after a moment of high controversy in the dying minutes denied Slaven Bilic�s side their first win in this part of the capital since 2002. 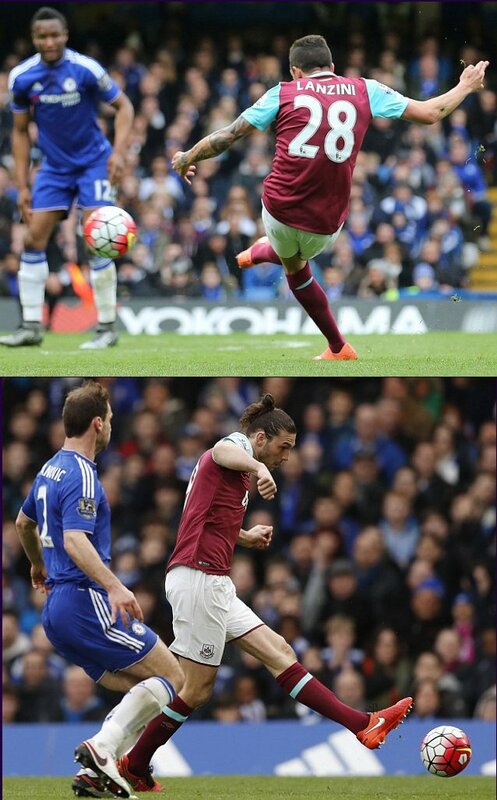 Before Robert Madley awarded Chelsea a penalty with one minute of normal time left, despite Michail Antonio�s foul on Ruben Loftus-Cheek appearing to take place just outside the area, it had seemed more likely that West Ham were going to score a decisive third goal to add to the strike from Andy Carroll that made it 2-1 in the 61st minute. Carroll had seen a header cleared off the line, Thibaut Courtois was required to make a fine save and West Ham were looking comfortable, knocking the ball around with tremendous assurance, until Antonio was penalised for bringing Loftus-Cheek down after Willian had led a sudden Chelsea break, allowing F�bregas to equalise from the spot. For West Ham, the wait for their first double over Chelsea since the 2002-03 season goes on, while they squandered the chance to take Manchester City�s place in the top four for at least 24 hours. They led twice, opening the scoring with a classy effort from the outstanding Manuel Lanzini, but their inability to kill Chelsea off was punished. However, once their sense of injustice evaporates, West Ham will reflect on a performance that further emphasised that they possess the talent to maintain their challenge for a place in the top four. A sign of their enhanced confidence could be glimpsed when Adri�n controlled an awkward, looping backpass from Dimitri Payet on his chest early on, juggled the ball on his thigh and volleyed it clear under pressure, and Bilic�s selection was bold, with Diafra Sakho and Enner Valencia able to start together in attack for the first time in almost a year. West Ham were bright and positive, breaking with energy, passing inventively and threatening in the wide expanses in front of Chelsea�s back four even before they went ahead thanks to Lanzini�s peach of a goal in the 17th minute. Bilic has tapped into the club�s sense of playing with style and adventure with his positivity and the shot that Lanzini curled past Courtois was a wonderful piece of skill. When Payet was tackled by Mikel John Obi, Lanzini collected possession 25 yards out, assessed his options and floated a shot towards the top-left corner that was in from the moment it left his right foot. The Argentinian hit it with curl and dip, the ball bending away from Courtois, and the away end was transformed into a pit of writhing, jubilant celebration. Chelsea were stunned, almost into submission and when Lanzini, whose impudent touches and ease on the ball made him a delight to watch, carved them open with a delightful backheel, Aaron Cresswell would have made it 2-0 if Branislav Ivanovic had not deflected his effort past the left post. There were other near-misses and the home side had absorbed a lot of pressure by the time F�bregas equalised with a lovely free-kick on the stroke of half-time. Although Lo�c R�my toiled in place of the suspended Diego Costa up front, Chelsea demonstrated their resolve after going behind, despite the disappointment of their exits from the Champions League and the FA Cup last week, and they slowly began to offer their supporters glimpses of the champion spirit of old. They raged at not being awarded a penalty when Valencia appeared to control the ball with his right arm, but when Winston Reid was booked for fouling Oscar on the edge of the area, F�bregas�s execution was perfect, Adri�n�s dive futile. Chelsea remained vulnerable to West Ham�s counterattacks, however, and Cresswell had already rammed a shot against the bar shortly before Carroll scored with his first touch a minute after coming on for Sakho. Payet released him, deceiving the defence with a sublime pass, and the striker threaded his shot past Courtois. West Ham failed to take their chances and although Chelsea seemed to have run out of ideas, with Alex Pato a glum presence on the bench, the sight of Payet collapsing to the floor near the halfway line when Madley pointed to the spot summed up the frustration for West Ham�s players.